Design Incorporated applied creativity and 3D design experience in our latest branded exhibition stand project – supporting the planned major strategic presence by BancTec at the recent Cloud World Forum at London’s Olympia. BancTec took a high profile 30m square space only stand for this show to reflect the significance of the timing and commitment to two major new service and product announcements being made during the event: BancPay offers small and large companies access to intelligent electronic invoicing services; while SocialVision provides compliance and control for social media and email platforms. A minimalist boutique inspired design solution was created for BancTec. The branded exhibition stand created a ‘coffee shop’ situated right next to the seminar rooms, this attracting a very high level footfall of visitors who not only sampled the ‘best coffee at the show’ but stayed to hear about the launch of BancPay and Socialvision. The branded exhibition stand features wood finishes, strong brand colours and concealed lighting. A main feature wall provided the backdrop to the coffee lounge, this was designed with a grid of window/apertures allowing passing traffic a teaser-glimpse of the activity on the other side of the stand. The other side of the wall features life size images of show visitors and the headline ‘See the other side of BancTec’ this is a play on the positioning and also reference the fact that BancTec is launching a new type of business offering – a subscription based service. Show visitors were invited to attend a special reception on the stand and a social media dialogue established before, during and after the event. 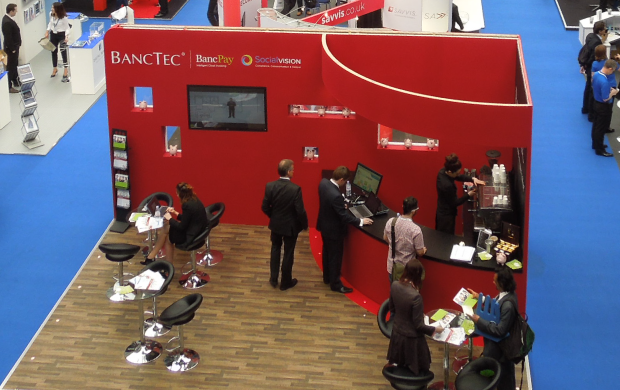 To see the creative work we have delivered to BancTec, including this branded exhibition stand, click here. To find out more about how we can support you with your own exhibition needs, contact Frank Norman on 01784 410380 or by email.